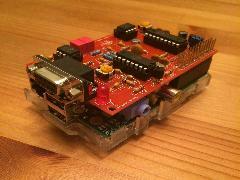 Not so long ago I completed construction of my Raspberry Pi TNC, the TNCPi. Construction of this kit was very straight forward. A few additional pictures would have made this a great kit for beginners, but still the same it's an easy build. A couple of items to note regarding construction. Ensure the correct polarity of the electrolytic capacitor (C1): The negative stripe goes toward C15. The transistor (Q1) PN2222's flat side goes away from the edge of the board. The voltage regulator (U1) MCP1700's flat edge goes toward the edge of the board. Crystal X2 (20MHz) is near U1. Crystal X1 (3.57MHz) is neat Q1. Note the pin 1 position of all ICs. After completing assembly of the TNC, I set to work on creating a radio interface cable to connect to the DB9 port on the TNCpi. After creating the cable, I set the audio output level as noted in the instructions. To do this, you'll need two radios. I used 2 HTs, one that I had created the interface cable for and a spare. Tune the radios to the same frequency (I used 144.44). On the radio with the interface cable, I pressed the PTT button and heard a tone being transmitted to the neighboring radio. Adjust R7 to it's maximum volume before it begins to distort. After tuning the audio, the TNC Pi project is complete. How you plan to implement the TNC Pi is entirely up to the software you choose. For many, this may be Xastir for an APRS GUI. For others, it may be aprx to create an APRS beacon, iGate, digipeater or any combination of the three. Page generated for 3.90.12.112 in 0.01182 seconds.